I, Nana Ziesche, the founder of the company, travelled 1992 the first time to India and 1993 to Ladakh. I liked it a lot there and I discovered my liking for dry mountain areas. So it went one after the other, I did some tourleading and founded my company Ladakh Travel. But as Ladakh has just a 4-months-season and even then there are no masses of tourists, first I earned most of my money somewhere else and just thought later about spreading all over the subcontinent of India. I thought this destination more and more exciting and really worth a travel. But the name Ladakh Travel didn’t suit well for that and so I thought of a second: Ganesh Travel. I always had (happy) clients, but it were too few and an experienced collegue always insisted that I should take his advise and have just one name for both companies. Then it would become better. I agreed – just couldn’t think of a nice suiting name…. One, which was uniting Ladakh and India, sounds sympathetic and catchy – in short: a name, with which I would at once say: yes, that’s it! – What is the name of your daughter? – This is not a common name. Does it have a meaning? 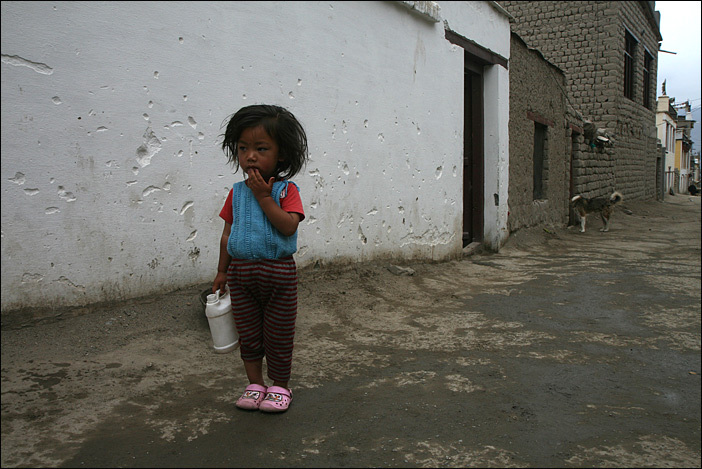 – It is a tibetan girl’s name and means as much as “candle, light”. That’s it! The name was born! And it didn’t suit only for my tours to whole India, it seemed to be also expandable if I wanted to rngage in more fields like publishing, which is now existing as Yangla Press. The idea of a Yangla Shops exists, but it is expensive and takes time to programme and organise the logistics behind. That will take some time. But then we have already the Yangla Magazin (sorry, just in german only). And my photography became Yangla Photo. Just the Kamerakidz will always stay Kamerakidz – although they also belong to the world of Yangla. For sure I wanted to meet the little name-giver and visited Urgain at her home. The small Yangla was then 2,5 years old und just my liking. With funny ears, a unique way of walking, a little heardheaded and on the whole friendly and kind.